Zaffiro is the Italian for sapphire, the second most precious stone, hence the logo. 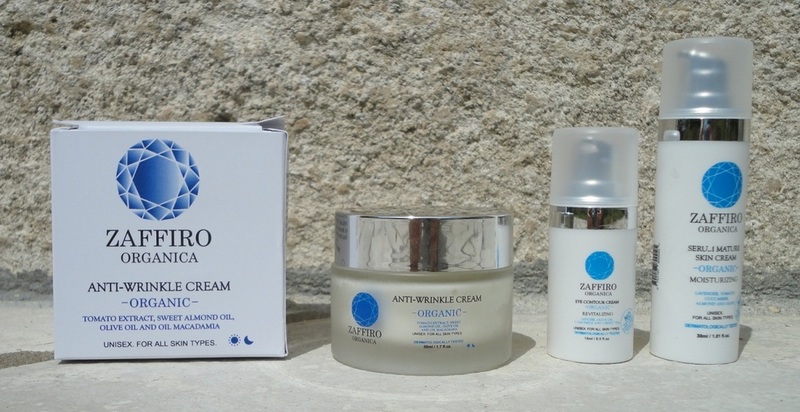 This new, almost pharmaceutical-grade skin care brand is of Italian inspiration and made in Spain. The brand has everything I love about skin care. It's made from all natural ingredients, without the noxious ones (no sulphates, parabens, petrolatum, phthalates or artificial colourants). It's cruelty-free and not tested on animals. 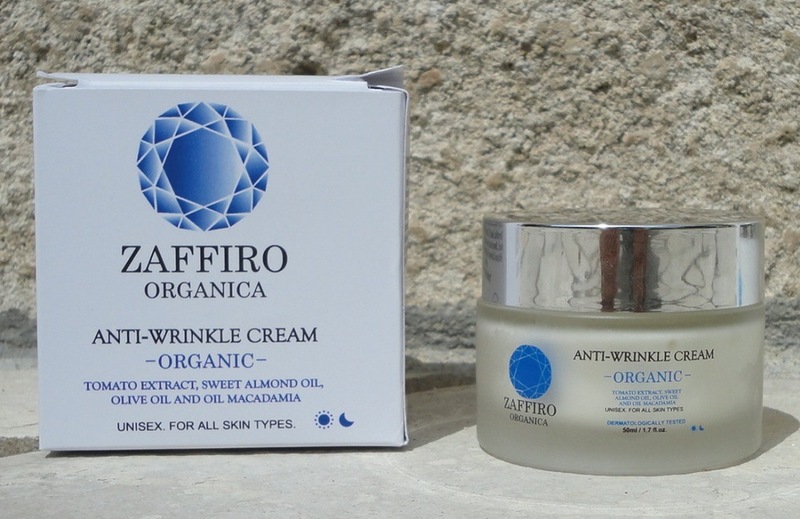 It employs a wealth of essential oil extracts and botanicals known for their powerful anti-ageing, firming, anti-inflammatory and rejuvenating powers. The glass jar contains 50 ml of product, a very rich and dense white cream which allows a little massage and penetrates easily, keeping my skin well hydrated all night. I have tried using this for daytime, too, after sunbathing and it seems to calm any redness and sensitivity. The ingredients are rich and practically edible: lavender, tomato extract, sweet almond oil, macadamia oil, various olive oil compounds, bitter orange, soybean and castor bean. While I appreciate the effort to keep artificial perfumes out of this very pure formula, I find the scent fresh but a little strange; since it does not linger, there is no clashing with any perfume I might be wearing. Like the serum and eye cream from the same range, this product is perfectly suitable for male skin, and my husband has been using it at night. 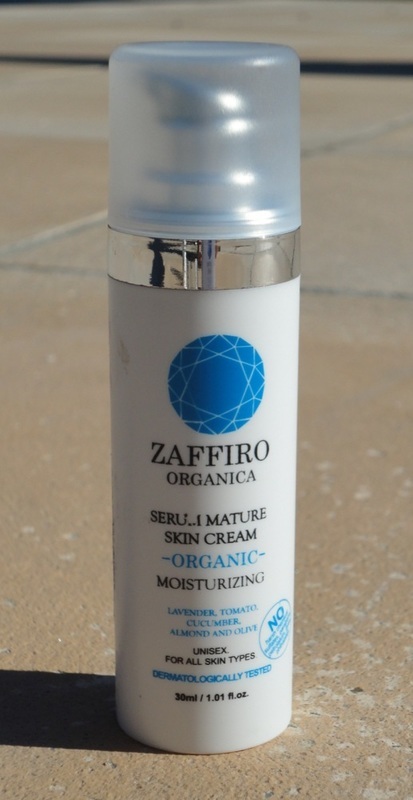 A very promising new line of very natural skin care that has been working well for us both. Due to my chronic sleep deficiency, my eyes always tend to look tired. On top of that, age doesn't help, so puffiness and black circles are daily issues for me which I have been addressing for a long time. I should stress that, since I have been using mostly natural skin care, things have improved to the point that when I try something new, I measure quality and effectiveness against already excellent products. I started testing this eye contour cream just over two weeks ago. It works extremely well for me, no sensitivity, no tightness, my eyes look better after I apply it and the skin in this very fragile area stays supple all day. Great under makeup, and very soothing at night. No need to repeat the list of ingredients as the product description is very detailed, but the main ones are Olive Oil, Camomile, Green Tea and Ginger extract. The plastic container has an airless pump applicator to dispense the minute amount needed for each application. The 15 ml should last a couple of months at least. Top product, perfectly suitable for male skin as my husband can attest. I have combination skin with a tendency to shine over the T-zone, so in theory a face oil does not seem like a good choice. However, having used this product for a few weeks, I have now added it to my regular nightly routine. The carrier base oil is sweet almond, a very light-textured oil which is absorbed by my skin without problems. The active essential oils (grapefruit, grape seed, rosemary and sunflower) add to the effectiveness, and they are the same ones I already use in my own mixes. 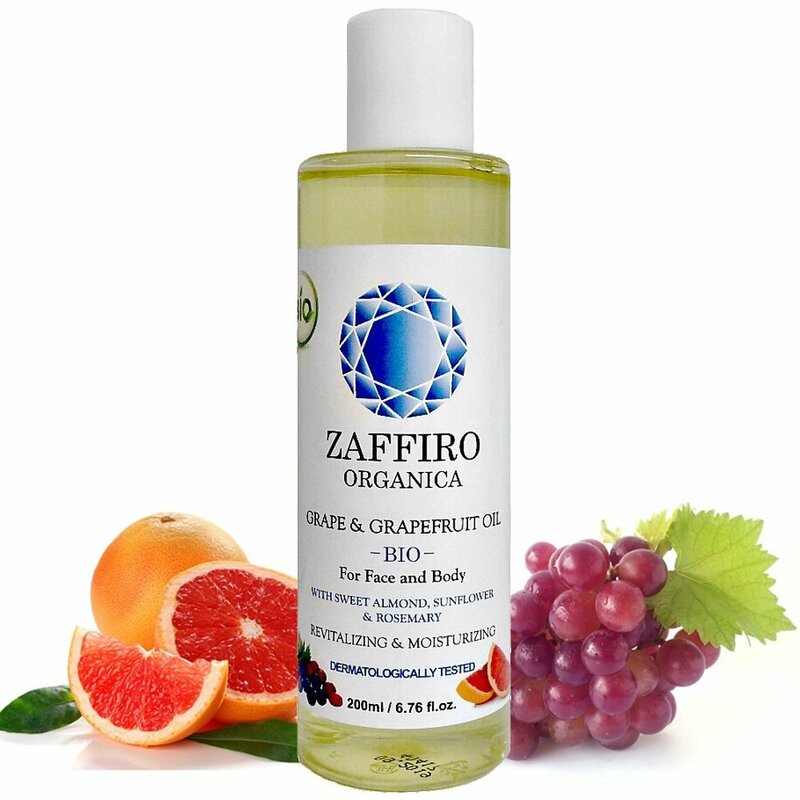 What I really love about this product is the grapefruit scent; it's fresh and delicious and does not fight with my own daytime perfume. My main use for this oil is as a body moisturizer (especially good after swimming and/or suntanning) and as a massage oil. It has an effect on sunspots, as well. I had major discolouration on my hands, arms and chest, and after using this product, the stains are less evident. The main ingredients are natural extracts, organic and bio, and I am delighted to have found something I can use without worrying about chemicals. It is also a cruelty-free product, not tested on animals. The plastic container, with an airless pump applicator, accurately dispenses the very small quantity needed for each application. 30 ml is a standard size for a serum and, judging by my use, it should easily last two months or more. The consistency is very thick and creamy, unlike most serums which tend to be gels or gelatinous lotions. Depending on your age, you might think that it's all you need in the morning, but generally a serum improves penetration of whatever you put on next, so don't waste this facilitating action and choose a hydrating product suited to your skin. For me, the cream by the same brand is working very well as a night cream and for the day I'm following the serum with a rich BB tinted product to simplify my make-up routine. I started testing this serum several weeks ago. No allergic reactions on my fragile skin, but a nice smoothing action that keeps my face nourished all day and all night. I love the all-natural ingredients: extracts of Lavender, Tomato (yes! ), Cucumber, Almond and Olive. What I love a little less is the scent, not exactly unpleasant, but a little too “botanical” for me. Luckily it does not linger. 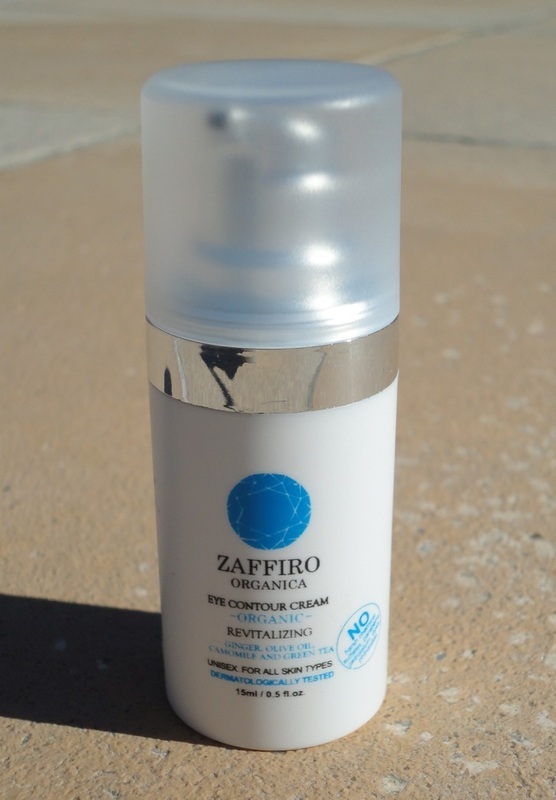 The serum is suitable for male skin as well, and my husband has been using it at bedtime.